For six years, boxing has waited with bated breath for a fight that it can heap exaggerations upon. And now, at last, here it is: Floyd Mayweather Jr., the cocksure fighter with the spotless record, will take on Manny Pacquiao, a scrappy champ and man of the people (he is a politician in his native Philippines) on May 2. They’re calling it, in all seriousness, “The Battle for Greatness,” probably because “The Stab at a Cash Grab” was taken, or something. And oh man, the cash: Projections have the fight raking in as much as $400-million U.S. in sponsorships, tickets, and pay-per-view purchases. They’re also calling it “The Fight of the Century,” which is actually more honest, because it will be a banner day for a sport that hasn’t had one in decades. In fact, the fight will be, by all accounts, the last gasp of a sport that has been in various stages of wane over the last 30 years. Pacquiao and Mayweather constitute the final true superstars of their sport, and this matchup is in large part so long-awaited because nothing else could compare. There are no heirs to either. And while professional team sports like football and hockey have engaged in paroxysms of existential concern over brain-health concerns, and have sought to varying degrees to evolve on the matter, boxing has insisted on forging ahead into obsolescence by allowing its athletes to be pummelled in the head so hard that sweat leaps off the body on each strike. 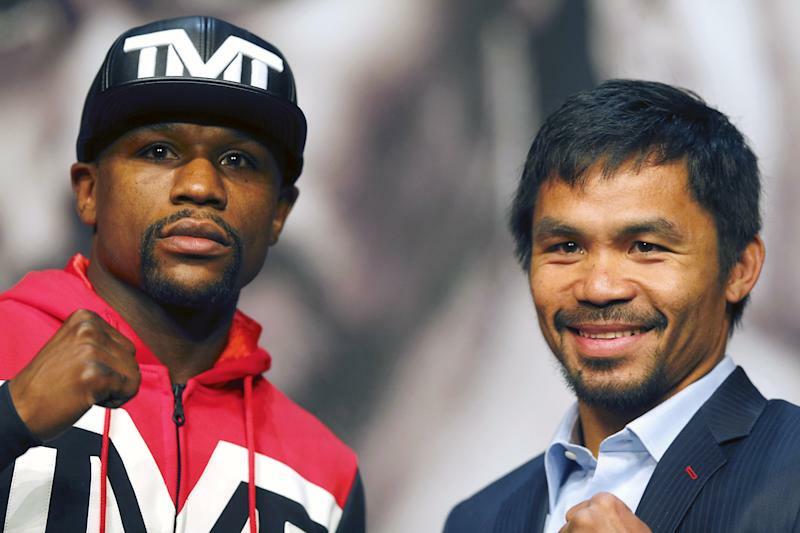 Boxing needs Mayweather vs. Pacquiao. Walking the fiscal talk: Was the Ontario budget credible? But then there’s the tricky problem of the first part of that equation: Floyd Mayweather, Jr. This is a man with criminal convictions to his name, for repeated instances of domestic abuse. There have been seven documented physical assaults on five different women that produced either an arrest or a citation. And unlike athletes like Ray Rice, rightly vilified for their own acts of abuse, Mayweather has been unrepentant, turning journalists’ hard questions about whether he should be allowed to fight into claims that only God can judge him, all while gleefully plugging the May 2 fight. And thanks to his sport, this unapologetic woman beater is expected to leave the ring on Saturday night with more than $100-million U.S.
For many, the lone argument for watching the boxing match is that there should be a separation between the entertainer’s personal life and the entertainment he provides, between the artist and his art, and there’s a worthy argument to be had over whether society can or must split the two. Whether we can appreciate the works of Roman Polanski or R. Kelly or Woody Allen in the wake of their respective allegations and charges, for instance—those are longstanding questions that remain up for productive debate. But that is impossible in Mayweather’s circumstance. There is no question that the art and the artist is one and the same. No matter how graceful we see Mayweather’s flurrying footwork, we can’t in good faith watch it without thinking of his ability to dance pathetically around the questions of interviewers over whether or not he should be allowed to fight. No matter how brutally beautiful his jabs and hooks appear, one cannot separate them from the fact that those are the very same fists that sent women—not just one, but a series of them—to the hospital. Could we condone watching a murderer perform murders? Would we watch, en masse, televised broadcasts of a showcase of skilled kidnappers? When viewers cheer on Mayweather’s boxing brutality—a much-admired trait within the ring—how can people not flash to the brutality of abuse? Between the ropes, there is simply no discernible line of dissonance between the act and his personal life. How can we possibly watch this without feeling some nausea? For many, activism is useless because it’s hard to see where a withheld dollar will go. But not so with the “Battle for Greatness.” Every dollar of pay-per-view and every gate entrance fee will go directly into the purse of this horrible, mawkish, meta funeral to a sport. Every dollar of this ghoulish display will go to a sport that has proven willing to literally beat itself to death; many of those dollars to a star that has proven that he’ll show no compunction in beating women. So do not throw your dollars at a sport already in its coffin, clawing vainly at the lid. After all, one of the last important punches of a dying sport will be thrown by a man who used those fists to beat a number of women. How could we possibly support that? Post-script: Unfortunately, abuse of women is not something that is dying or going away. So perhaps donate to that cause, instead. Consider sending your $100—the cost of watching the fight on pay-per-view—to the Assaulted Women’s Helpline or Interval House, Canada’s first centre for abused women and children.